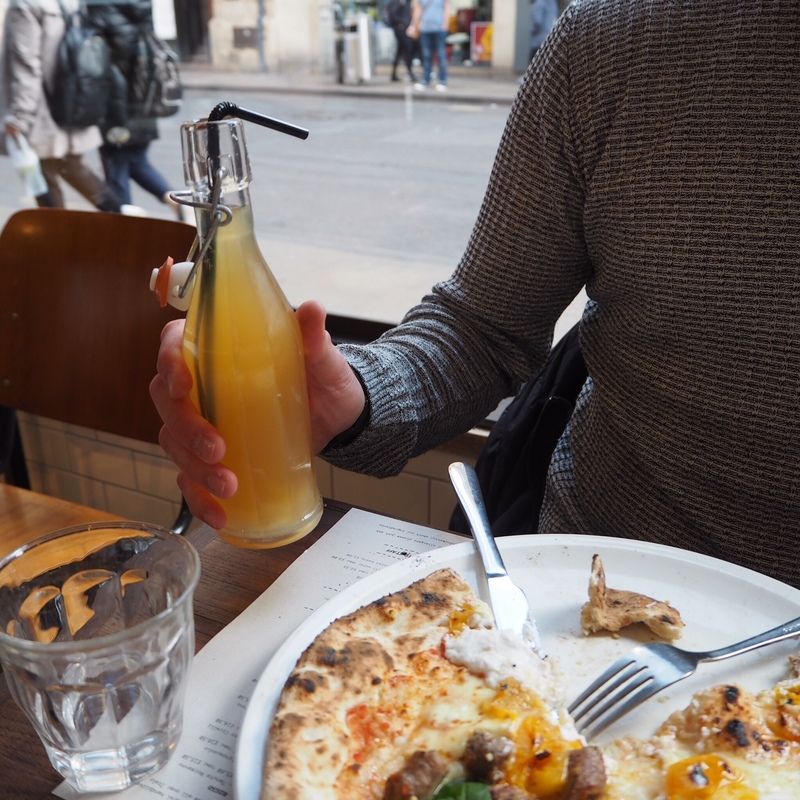 Franco Manca Oxford – is it worth the hype? 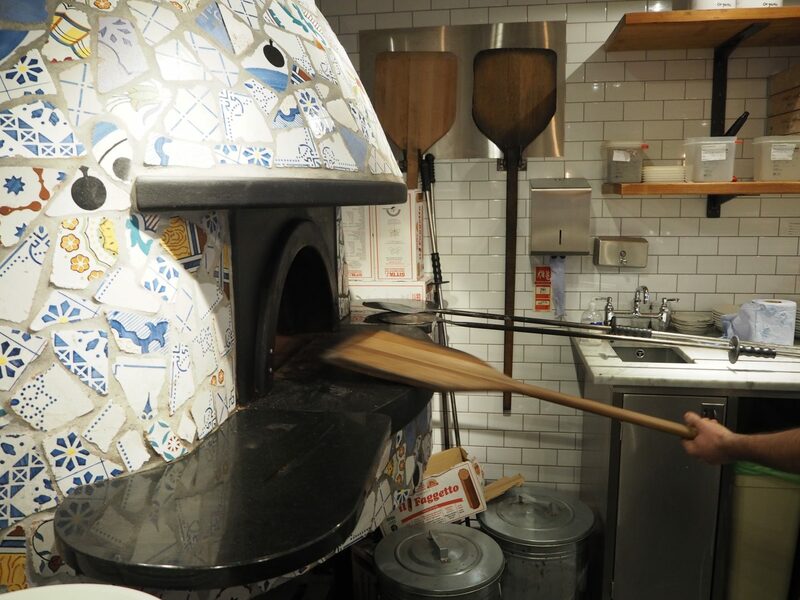 Franco Manca has shaken up the popular Italian restaurant market in the UK with its sourdough pizza’s and fresh, simplistic menu with only 7 choices of pizza available at very reasonable prices. Having opened in Oxford during the summer, Franco Manca has proved a popular choice for many locals and tourists alike. 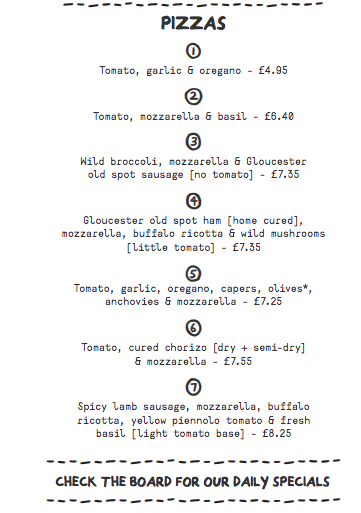 With 5 places to choose from on the same street to grab a pizza (George Street), why would you choose Franco Manca? In this post I’ll tell you all about my experience there and whether or not I think you should try it if you already haven’t. As you walk in you are greeted by the friendly staff, including the manager Christian and swiftly seated. We went during a Monday lunch time and were fortunate that we did not have to wait in a long queue that you might find on a Saturday night. You are immediately greeted to a preparation area to your right hand side which includes a proper authentic ham/salami slicer you would find in a good deli and Franco Manca’s large wood fired oven which they use in all their restaurants and is custom made for the company, according to Christian. We sampled the ‘Chorizo bite’ which costs £2.55 and includes a small handful of freshly cooked Chorizo slices. They were delicious and a nice start to the meal. Not something I would typically order but would recommend trying it. I chose pizza number 7, which included, Spicy lamb sausage, mozzarella, buffalo ricotta, yellow piennolo tomato and fresh basil which all costs £8.25. Before visiting Franco Manca I had never tasted sourdough pizza before. I’d say pizza is my go to take away food/restaurant meal out food and I must say what an incredible experience it was to try this new type of pizza dough. It was the freshest tasting dough I have ever eaten which somehow in my opinion, was light and fluffy but proper doughy and filling at the same time. Exactly what I want from a pizza! According to Christian, the dough is made fresh and not brought in frozen. It takes 24 hours in a temperature controlled room to become ready for cooking with. It is then prepared in the open plan area as you see in the restaurant, your toppings are added and this is the amazing part. It takes approximately 1 minute to cook in the 500 degree specialist wood fire oven. That part really amazed me! No wonder their pizza tastes so fresh. Christian explained to me that its the little things put together which separate Franco Manca from most pizzeria’s. All ingredients where possible are sourced either directly from Italy, or to keep costs low and taste quality high they source other products locally but always maintain the goal to keep it fresh and of high quality. For example some of the cheeses for the pizza were sourced from Gloucester, I was told. We tried the freshly home made lemonade which you can see in the rustic kilner clip top bottle’s. The lemonade is particularly sweet as you would expect but really kept that fresh lemony taste making it a lovely blend of sugary and sour. In my opinion the pizza at Franco Manca blew all the other large Italian large chain restaurants out of the water. It was their pizza dough which really made it for me and I will be back in the near future for sure. Overall I would give my dining experience and pizza a 9/10. There was very little, if anything, at fault.